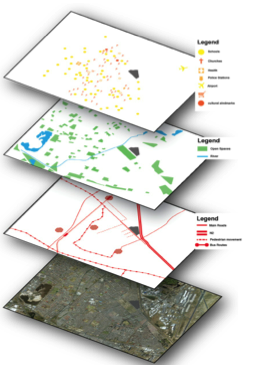 Over the last four months Europe community members and Masters students of Urban and Regional Planning at the University of Cape Town (UCT) collaborated on a joint planning studio to address some of the community’s most pressing concerns. Together, they began by conducting a site analysis and researching the opportunities and constraints presented in Europe. This research and site analysis led to developing concepts for in-situ, incremental upgrading projects. Read more about the concepts and the first developments of the studio here. The students then split into three groups and used these concepts to produce spatial development frameworks (SDFs), which act as a guiding document on the future development of Europe and surrounds. 3) Increasing socio economic opportunities in Europe. These proposals fittingly introduced the concept of incremental settlement upgrading. 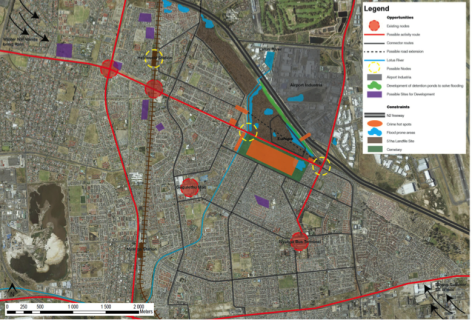 The site analysis revealed the presence of several aquifers and wetlands on the site and along Klipfontein Road. In order to protect and enhance Europe’s scenery this natural biodiversity could be joined with pedestrian routes to attract different users to the site. The area around Europe contains several sites of recent South African history that could increase the area’s potential as a cultural node. 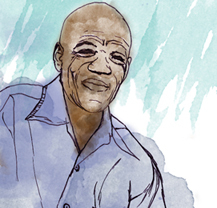 By connecting to sites such as the Gugulethu Memorial 7 and cemetery and cultural tours to the Cape Flats, residents could increase their access to economic opportunities. Although residents in Europe do not have tenure security, Europe’s leadership has recorded an enormous amount of property transfer in the settlement due to the high demand for well located affordable housing. During a transaction, the leadership keeps certified identity documents of both parties. These serve as a proof of sale of one’s property. Even in their derelict state most shacks have sold between R10 000 to R15 000. Through their engagement, the students picked up on the importance of location – in terms of one’s own shack and in terms of the settlement location as a whole. They therefore introduced the concept of re-blocking as an incremental approach to housing which would decrease the level of flooding, open spaces for the provision of basic services, communal spaces and spaces of interaction. Moreover, it would improve the quality of life in the whole settlement. Many groups viewed re-blocking as a short-term strategy that could be implemented easily without displacing people. It would also provide residents with the opportunity to access short-term housing structures. 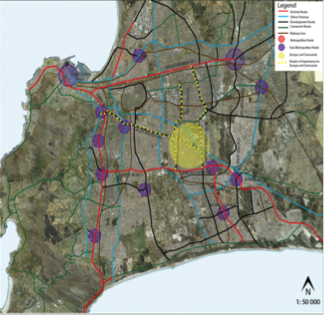 The Cape Town SDF sets out a hierarchy of different movement routes across the metropolitan area. It focuses on North – South and East – West accessibility. 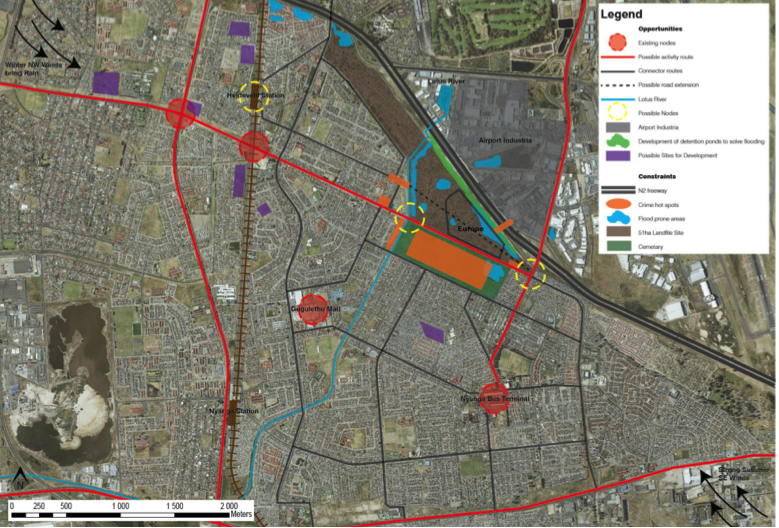 Europe’s location between an urban freeway (N2) and a development route (Klipfontein RD) means that Klipfontein Road presents a greater potential for activity nodes than the impenetrable N2. Heideveld station also provides a critical link between the road and rail network, making this an important node for future development. The analysis uncovered that the Golden Arrow bus route bypasses an important section of Klipfontein Road. This means that the residents of Europe and surrounds, who are already earn a low-income, need to pay for additional taxi transport to reach the closest bus and train station. Some residents also use the local transport ‘Amaphela ‘ due to the area’s high crime levels, which make walking unsafe. As a MyCiti bus station will soon be implemented in Mitchell’s Plain, the intersection between Bocherds Quarry and Klipfontein Roads will in all likelihood grow as a transit node. 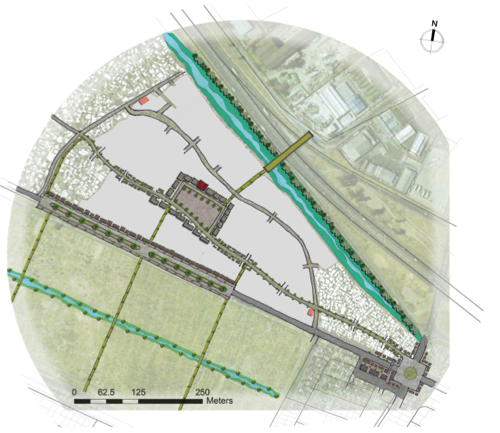 It therefore has potential to develop into a transport interchange with supporting activities. Throughout this discussion it was crucial to see Europe as a functional settlement in its own terms and thus limit the distance travelled to access jobs and other socio –economic opportunities. Much developmental activity has focussed on improving upcoming North-South corridors such as Parklands and Mitchell’s Plain. There is a need therefore to establish linkages to upcoming opportunities. There is also a need to increase vertical connections to the settlement such as access to Voortrekker Road, which is one of the busiest roads connecting Bellville and Cape Town. After several discussions with the community, the importance of access to employment and food security was clear. 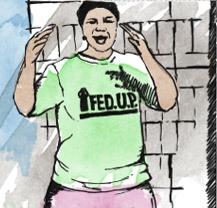 Residents felt that they needed to be able to support their households in order for them to start looking at broader issues such as upgrading. After this discussion the community came together and collected their names and livelihood interests on a piece of paper. Those with common interests were then grouped together to begin discussing how they could start livelihoods programs. These included hair dressing, carpentry, gardening etc. The students put together a pamphlet in isiXhosa with a list of organisations that assist in skills development such as Abalimi Basekhaya and The Carpentry Shop. In the next phase of the studio the students will develop precinct designs of the settlement and write a short reflection of the studio as a whole.